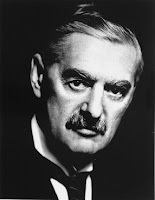 Audi Alteram Partem: Obama: Walking on Israel in Chamberlain’s Shoes? Allen Z. Hertz was senior advisor in Canada's Privy Council Office serving the Prime Minister and the federal cabinet. Formerly he worked in Canada's Foreign Affairs Department and earlier taught history and law at universities in New York, Montreal, Toronto and Hong Kong. He graduated from McGill University with First Class Honours and the Minister of Education's Gold Medal in History. He holds a Ph.D. in East European and Ottoman history from Columbia University and international law degrees from Cambridge University and the University of Toronto. A version of this article was first published in September 2009 by The Jewish Telegraphic Agency -- JTA: The Global News Service of the Jewish People. Related postings on this website include "Religion and Politics: What Barack Obama could learn from Benjamin Disraeli" and "Obama's Cairo Speech: Line-by-Line Israel Analysis." immense importance... to have the Moslem world with us... If we must offend one side, let us offend the Jews rather than the Arabs. The fundamental immorality of impeding Jewish migration was all the greater because, with respect to the western part of Mandate Palestine, the international commitment to the Jewish People had already been crystal clear. From the Jordan River to the Mediterranean Sea, "a national home for the Jewish People" had been created via a series of declarations, resolutions and treaties from 1917 to 1923. But, this was no concern of Chamberlain, who on July 30,1939 wrote to his sister Hilda: "No doubt the Jews aren't a lovable people; I don't care about them myself..."
I don't care about them myself." As tension now grows over Iran’s race to develop nuclear weapons, President Obama seeks rapprochement with the Muslim world, including dialogue with Iran. Can we ask if there are similarities between Obama and Chamberlain? April 2009, Obama bows low to the King of Saudi Arabia at G-20 Meeting in London. With scant foreign-policy experience, both came to office with an abundance of self-confidence to lead a declining Great Power with acute fiscal troubles and far too many global responsibilities. And, each arrived with a strongly held belief that international sins of his own country had to be made right as part of an energetic search for a general peace. Thus, Chamberlain saw the 1919 Versailles Treaty as a draconian imposition that had driven Germany to Nazi dictatorship. Similarly, Obama blames the USA and the West for colonialism and imperialism that are seen to have injured the developing countries, including the Muslim World. And, like Chamberlain, Obama reaches out to opponents, acknowledges their suffering and seems to promise reparation for past wrongs. in order to appease dangerous opponents. History’s verdict is that Chamberlain was astonishingly naive. 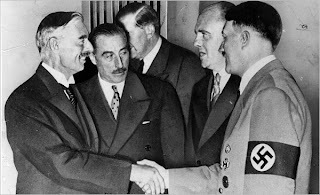 As for Obama, it is too early to say whether he will follow Chamberlain’s path in seeking to appease dangerous opponents at the expense of friends. 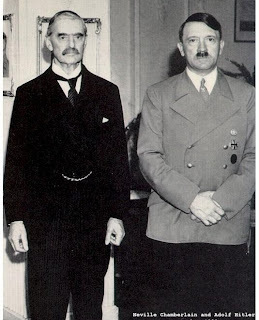 Chamberlain betrayed Czechoslovakia in 1938. 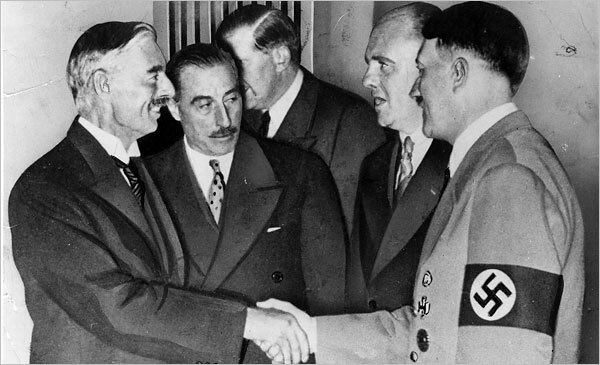 And, had Hitler agreed to refrain from using force in 1939, Chamberlain was then prepared to offer Germany large parts of Poland’s territory. Assuredly, the Chamberlain-Obama comparison is invidious and, in this partisan vein, it was raised during the USA presidential campaign in 2008. Now the comparison deserves fresh consideration, particularly in the light of President Obama’s June 4, 2009 Cairo speech to the Muslim World. June 4, 2009, President Barack Obama in Cairo. In Cairo, Obama sought the appearance of even-handedness in discussing the long-standing dispute between Israel and its Arab neighbors. But, read with an eye to the moral context, his Cairo speech was profoundly anti-Israel. This anti-Israel bias was camouflaged by a dramatic reference to the Holocaust and by other acknowledgements of Jewish suffering over the centuries. Obama was likely advised that such sentiments would resonate with USA Jews. However, Jews in Israel were too canny to be fooled by the Cairo speech, after which public opinion polls there saw his approval rate drop like a stone. In 2008, he also denied his childhood practice of Islam; knowledge of the anti-Israel and anti-USA rants of his long-time pastor Jeremiah Wright; and a close relationship with Bill Ayers, a former member of the Marxist terrorist group known as the Weather Underground. His penchant for such implausible denials goes part way toward explaining why current opinion polling shows that USA perceptions of Obama’s trustworthiness are gradually eroding. The three denials were also early predictors that he would be cold to Israel for religious, cultural and ideological reasons. Obama had taken one of Prof. Said's courses. ﻿White House speech writer Ben Rhodes has said that the Cairo speech showed “frankly, just how he [Obama] personally views the conflict.” Rhodes also said that Obama mulled over every line, every word of the speech. This is significant because, with respect to Israel, the Cairo speech was marked by dissimulation and implication that morally condemned the Jewish State, while largely validating the narrative of Arabs and Muslims. Dissimulation was also salient with regard to Jerusalem, in relation to which Obama implied that Israel has failed to accommodate the needs of Muslims and Christians. 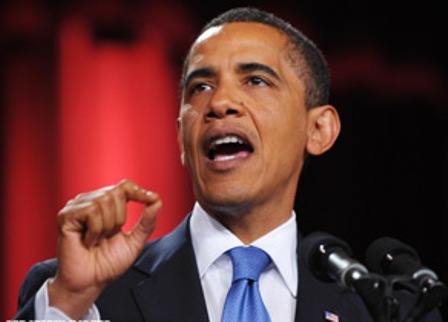 Moreover, the Cairo speech specifically spoke about working for the day when Jerusalem would be “a place for all of the children of Abraham to mingle peacefully together as in the story of Isra.” Here, Obama cynically calculated that non-Muslims would perceive this passage as an anodyne ecumenical reference, while Muslims would understand the Isra story as relating to the Prophet Muhammad’s alleged trip to Jerusalem’s Al-Aqsa mosque. There, the hadith say that Muhammad was validated as God’s final messenger by his prophetic predecessors, including Moses and Jesus. Thus, for Muslims, the Isra story points to their claim to Jerusalem and their belief that Islam is superior to Judaism and Christianity. For two centuries, the political and legal doctrine of the self-determination of Peoples has been an engine of world history. The Cairo speech significantly referred to the Palestinian People at least five times without offering a hint that Arabs living around the Jordan River did not generally self-identify as a distinct "Palestinian People" before the late 1960's. By contrast, Obama referred only once to the very ancient Jewish People, not as proud bearer of rights, but in its Diaspora persona as victim. 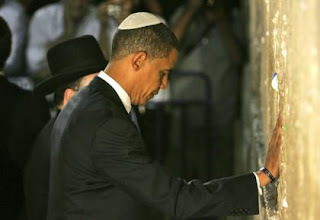 Otherwise, Obama used “Israelis” or words that implied an “Israeli People.” Obama’s terminology thus favored a newborn Palestinian People and implicitly challenged Israel’s legitimacy by ignoring its key political and legal claim to embody the self-determination of the Jewish People, whose subjective-objective national identity reaches back at least twenty-five centuries. In Cairo, Obama had nothing to say about close to 1400 years of persistent Arab and Muslim discrimination against Jews, including periodic persecution of the Jews in the Holy Land (Eretz Israel). By contrast, he repeatedly implied that Israel is responsible for Palestinian Arab suffering from 1948 to the present. Thus, he referred to Palestinian refugees, failures in economic and social development, “daily humiliations… that come with occupation” and a so-called “humanitarian crisis” in Gaza. Evidently, how Obama “personally views the conflict” is deeply flawed. For example, would the Mideast have had any Jewish (circa 850,000) or Arab (circa 600,000) refugees had Arabs locally and generally followed Jews in embracing the 1947 UN General Assembly resolution calling for peaceful creation of two new States, the one "Jewish" and the other "Arab"? Similarly, the Cairo speech falsely implied that Israel has been the obstacle to a "two States" solution. Thus, Obama said nothing about Prime Minister Sharon’s unilateral withdrawal from Gaza in 2005. And, he was silent about Yasser Arafat and Mahmoud Abbas’s failure to accept far-reaching "two States" offers by Prime Ministers Barak and Olmert, in 2000 and 2008 respectively. This goes to the crux of the long-standing dispute. Since the 1937 Peel Report, first Zionists and then Israel governments have repeatedly accepted the partition idea, i.e. two States for two Peoples. By contrast, Arabs locally and generally have largely rejected the principle of "the Jewish State," i.e. the idea of having there an independent country to embody the self-determination of the Jewish People. In Cairo, Obama deliberately chose to ground rights in mere suffering. This was curious, because as a lawyer Obama had to have known volenti non fit injuria -- the Common Law principle that the plaintiff cannot recover damages to the extent that he himself has caused the harm. Moreover, plaintiffs are required to take timely steps to mitigate their losses, no matter how caused. But, the Cairo speech never asked to what extent Palestinian Arab suffering might be the result of their own bad choices, including their share of responsibility for starting the 1948 war, which was a self-proclaimed Arab attempt to exterminate the Jews living between the Jordan River and the Mediterranean Sea. The Cairo speech repeatedly drew from the familiar arguments of Israel’s bitter enemies. First, Obama’s present-tense references to “Palestine” clearly begged the question, because there is still no State by that name. Second, Obama slandered Israel by implying a false comparison between the suffering of Palestinian Arabs and that of Black people in the USA. Third, this invidious comparison was reinforced by a gratuitous reference to “segregation” which seemed to slyly point to the canard that Israel is an apartheid State. Fourth was an inappropriate nod to White South Africa and other instances where indigenous Peoples offered “resistance” to colonial rule. Fifth, Obama implied that Palestinian Arab suffering can be equated with the Holocaust, which is a grotesque and wildly inaccurate comparison that is close kin to the calumny that Israel behaves like Nazi Germany. Finally, Obama implied that the European murder of six million Jews was the ideological basis for Israel’s creation. As a lawyer, Obama had to have known that Israel validates itself, not by the Holocaust, but by virtue of the political and legal doctrines of aboriginal rights (normally minority rights) and the self-determination of Peoples. The Jewish People has aboriginal rights in the same way as do the native "First Nations" in Canada. And, the Jewish People invokes its self-determination right exactly as does the great Arab People, whose self-determination is already expressed in the twenty-one countries that explicitly self-identify as Arab. The Cairo speech pandered to Arab and Muslim prejudice by ignoring the presence since pre-Biblical times of large numbers of Jews in the Mideast, including some who -- in each and every decade -- lived in the Holy Land (Eretz Israel). There, of all extant Peoples, the Jewish People has the strongest claim to be aboriginal. For this reason, two decades before the Holocaust, the aboriginal rights of the Jewish People were embedded in international law by the settlement after the First World War. Within a larger Mideast and global framework, justice was done because simultaneously there was creation or recognition of several new Arab States that were freed from Turkish rule and placed on the road to eventual independence; as was the “national home for the Jewish People,” from the Jordan River to the Mediterranean Sea. By ignoring the Jewish People’s aboriginal and self-determination rights, the Cairo speech was notably devoid of a compelling moral or legal rationale for Israel’s creation. In Cairo, Obama called for an end to Palestinian violence which was dignified as “resistance.” But, apart from an appeal to end reciprocal suffering, he offered Arabs and Muslims no convincing moral or legal reason for stopping what they largely consider to be their just war against the Jews. To the contrary, Obama probably diminished prospects for peace by alienating Jews in Israel and failing to provide Arabs and Muslims with an ideological foundation for a peaceful process to respectfully reconcile the prior rights of the Jewish People with the subsequent rights of the newborn Palestinian People. The latter now has claims to self-determination and some territory. But, such Palestinian claims cannot cancel the prior rights of the Jewish People, which notably include the right not to be killed by neighbors. This means that the newly self-identified Palestinian People lacks the right to wage a war of national liberation against the Jewish People, the presence of which is not colonial. Though repeated lip service was paid to Israel’s "right to exist," the Cairo speech consistently painted a moral picture that seemed to argue the contrary. Saying “threatening Israel with destruction is deeply wrong” was probably calculated to resonate with USA Jews who are grateful for Israel’s survival. By contrast, most Jews in Israel have the commonsense to understand that their country deserves much more than mere survival. They know that Israel urgently needs the same rights normally enjoyed by other countries, and that Israel must be judged according to the identical standards regularly applied to other States, in the same or similar circumstances. The structure of the Cairo speech implausibly suggested that Iran’s race to develop nuclear weapons is today less “a major source of tension” than “the situation between Israelis, Palestinians and the Arab World.” In discussing this Iranian nuclear threat, Obama seemed to signal that he might be willing to break with a decades-old understanding that the USA would refrain from publicly addressing whether or not Israel has nuclear weapons. The implication here was that Obama would perhaps follow Chamberlain’s playbook by making Israel’s nuclear weapons part of a broader deal, embracing Iran and other States in the region. 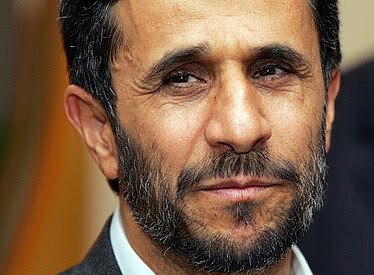 has threatened "to wipe Israel from the pages of history." Was a major shift in USA foreign policy heralded by the speech’s apparent challenge to Israel’s ideological foundations and security interests? Obama placed a special focus on Palestinian Arab suffering that disturbingly recalls Chamberlain’s exaggerated concern for Czechoslovakia’s three million Sudeten Germans. Chamberlain’s myopia rapidly led to the destruction of interwar Czechoslovakia, then the only democracy in Eastern Europe. With Europeans appearing as themselves and the Palestinian Arabs as the Sudeten Germans, does President Obama cast himself as Chamberlain? The British Prime Minister earned obloquy by being too eager for a general settlement at the expense of “people of whom we know nothing.” While irresponsibly failing to face the question of Hitler’s ultimate aims, Chamberlain recklessly sought peace by catering to German demands, including at the 1938 Munich Conference. Is Obama similarly searching for a general settlement that betrays Israel’s vital interests to the advantage of 21st-century Hitlers as portrayed by Iran’s leaders with the help of proxies, including Syria, Hezbollah and Hamas? A careful reading of the Cairo Speech suggests that Obama may believe that a weaker Israel now suits the interests of the USA. If so, he should honestly tell the American people why, instead of offering a fabric of dissimulation and implication. And, friends of the Jewish State should see Obama’s moral condemnation of Israel as a flashing red light that warns of the possibility of betrayal; just as Czechoslovakia was pressured to accept an unsafe peace that was prelude to disaster. Neville Chamberlain with Adolf Hitler in September 1938.